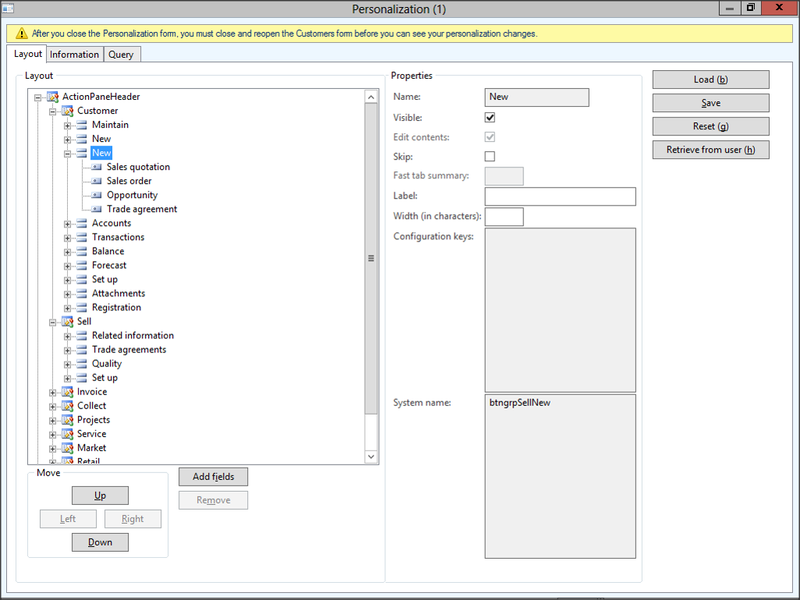 Everyone knows that you can personalize forms within Dynamics AX to show just the fields that you want. But don’t forget that you can also personalize the ribbon bars to your own tastes as well, by hiding groups of menu items that you don’t use, and also move menu items from one ribbon bar to the other to make them easier to access. By streamlining your forms, you can get rid of all the kipple that is cluttering up your daily access to Dynamics AX. 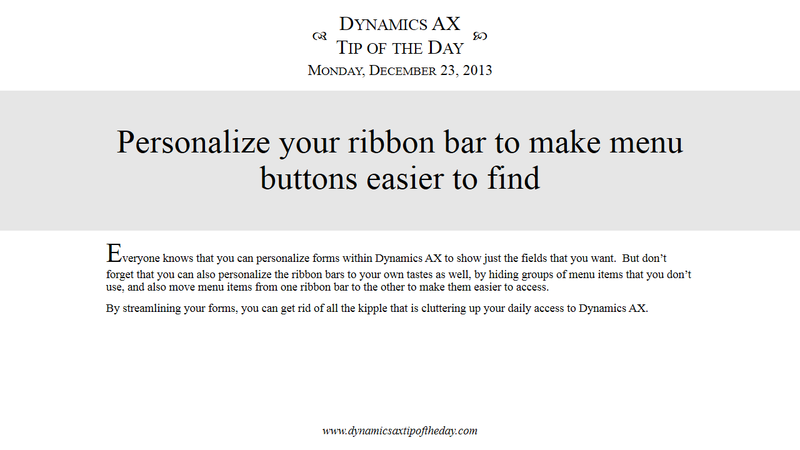 Right-mouse-click on the form that you want to personalize the ribbon bar for, and select the Personalize option. 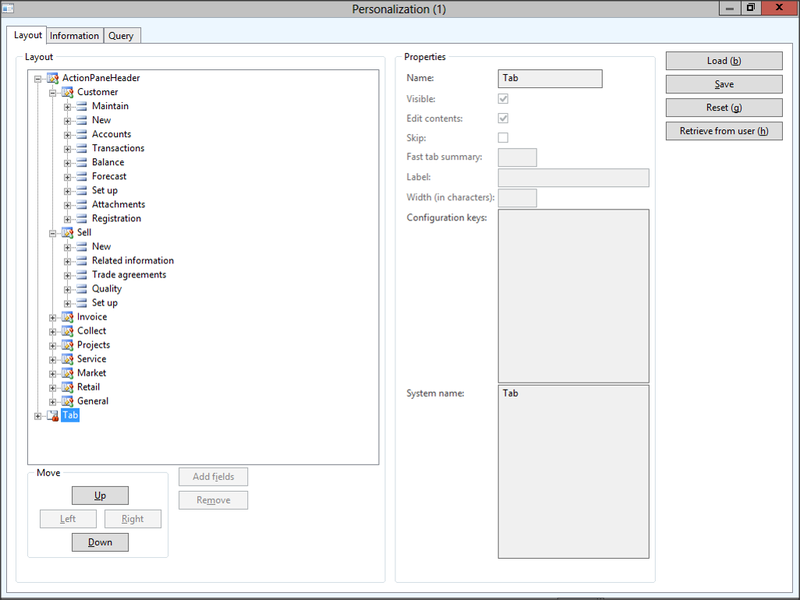 When the Personalization dialog box is displayed, you will notice that there are two main groups in the Layout panel. By default the personalization starts off with the Tab group selected, which allows you to personalize all of the fields and groups in the body of the form. If you select the ActionPanelHeader group though, you will see all of the buttons and groups for the ribbon bar. You can hide any of the menu buttons just by overriding the Visible option, and you can also move entire groups of buttons just by dragging and dropping them from one group to another. In this example we moved all of the selling transactions from the Sell ribbon bar to the Customer ribbon bar. Now all of our transactions are at our fingertips within the Customer ribbon bar group. 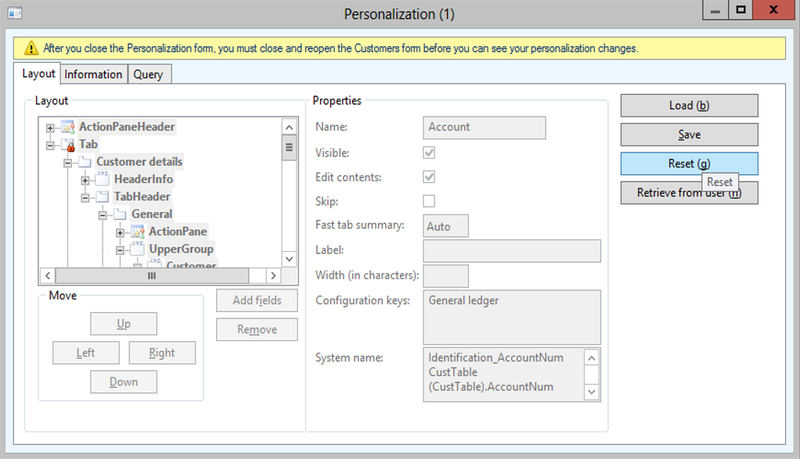 Remember though, you can always return back to the default view and remove all of your customizations for the forms just by clicking on the Reset button within the Personalization dialog box.